A trip to Far North Queensland just isn’t complete without experiencing the raw, prehistoric beauty of the mighty Daintree Rainforest. Just an hour north of Port Douglas, the Daintree Rainforest boasts the highest variety of plants and animals found in any rainforest on the planet. The Daintree Discovery Centre allows visitors to experience these interesting species, as well as the history and Indigenous Culture of this ancient environment, through self-guided Daintree Rainforest tours or professionally guided groups tours. The Daintree Rainforest is widely accepted as the oldest tropical rainforest in the world. The oldest part, north of the Daintree River, is estimated to be over 150 million years old! The Daintree Rainforest is home to the endangered Southern Cassowary and the oldest flowering plant species known as Idiot fruit. There are many interesting things to see in the Daintree Rainforest, so step back into a prehistoric era, drop into the Daintree Discovery Centre and learn all about the weird and wonderful things you can see. The Daintree Discovery Centre is the #1 Attraction in the Daintree Rainforest. View the Centre’s interactive map for a closer look at the attractions available. Have you been looking for a Daintree Rainforest tour? We also provide an audio Daintree Rainforest tour included as part of the entry fee for you to enjoy! We have so many natural wonders on display, so don’t miss out on the wonderful opportunity to explore everything the Daintree Discovery Centre has to offer on your visit to the Daintree Rainforest. Arthropods – spiders and insects – are the largest group of animals on earth and some unique and, to be fair, downright scary examples can be found at the Daintree Discovery Centre. Take Nora the Australian rainforest tarantula. On the menu for her are insects, lizards, frogs – and other spiders. Australian tarantulas are known as the most aggressive in the world and are fearsome hunters. Nora’s neighbours at the centre are generally less deadly but no less intriguing. And while our spiny leaf stick insect looks more like a leaf than a twig there’s no mistaking the very large but very harmless – to us – huntsman spider. It doesn’t need a web to hunt because it’s so fleet of foot. 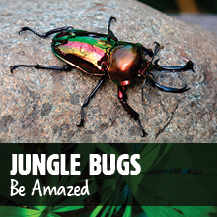 Find out why we love bugs so much at the Daintree Discovery Centre. 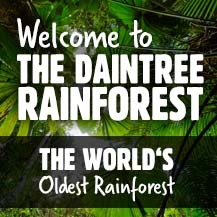 While much interest is centred on the “forest” part of Daintree Rainforest, the “rain” part is equally fascinating. The waterways that make the Daintree region unique provide habitat for scores of creatures from single cell organisms to apex predators. The Daintree River, its tributaries and the many creeks that flow through the forest are teeming with life, much of it endemic to the region. In our Rainforest Freshwater Aquarium – the only one in Australia – visitors can see everything from archerfish, with its onboard water pistol for shooting insects down to the mighty barramundi which can grow up to 1.8 metres. At the other end of the scale(s), try to find tiny 2cm long rainbow fish, or spot some freshwater prawns. 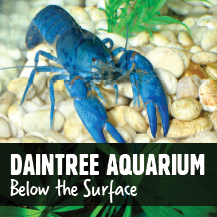 And to find how everything works together, our Daintree Aquarium takes you on an aquatic journey from mountains to mangroves. The Daintree Discovery Centre is one of the best places to see wild Cassowaries in their natural habitat. Our Centre is located in the middle of a natural ‘Cassowary Corridor’, established by the abundance of mature fruiting trees and the beautiful McLean’s Creek that flows adjacent to our elevated walkways. The Creek is a natural watering source for these majestic birds who often drink and bathe themselves in the pure rainforest water. Our platforms and elevated walkways provide safe and easy viewing of our endangered Cassowary friends, for thousands of visitors each year. The Southern Cassowary is the third tallest and second heaviest bird in the world with brilliant black and blue neck wattles and a tall ‘casque’ or helmet on the top of their heads. They are impressive birds to see in person, especially if you are lucky enough to come across them in the wild. At the Daintree Discovery Centre you may be lucky enough to see one of these amazing birds wandering along the creek, foraging for fallen fruit. They may even have a clutch of chicks in tow. Truly a once in a lifetime experience! Our self-guided rainforest tours are the most interesting, flexible and affordable Daintree Rainforest tours available. Whether you are spending a few hours or an entire week in the Daintree, our rainforest tours can be tailored to suit your itinerary and interest level. Featuring personal handheld audio guides, a take home 68 page Daintree Rainforest Guide Book, loads of interesting signage, displays and wildlife exhibits, our specially designed Daintree Rainforest tours allow you to absorb all of the fascinating information about this precious environment, at your own pace. 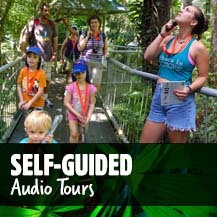 Our self-guided rainforest tours are included in the price of admission, and with 4 separate audio tours available in 8 different languages, you can be sure to enjoy this completely unique Daintree Rainforest experience. Learn about the history, culture, plants and animals of the Daintree and how they have survived for millions of years! 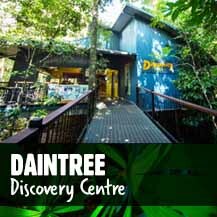 Be sure to take advantage of this free and inclusive audio tour to receive the comprehensive Daintree Discovery Centre experience. Experience the Daintree Rainforest from a whole new perspective. 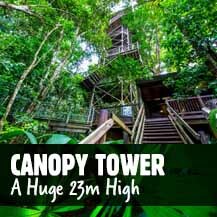 Standing at an impressive 23 metres high, the Canopy Tower allows visitors to access all levels of the Daintree Rainforest, including the upper most reaches of the canopy. With five different viewing platforms and seating on each level, visitors can rest and enjoy the unique plant and animal life at each landing. However, it is the the top of the Tower provides the most unique viewing experience in the Daintree Rainforest. The Tower stands high above the tree line and visitors can look out across the vast expanse of treetops that make up this dense, sprawling rainforest. The view from the top of the Tower is breathtaking and simply cannot be missed. This unique perspective provided by the Canopy Tower is a must do for you and your family on your visit. 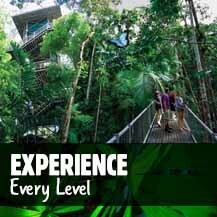 Rated as one of the top ten skywalks in Australia by Australian Geographic, the Aerial Walkway provides unprecedented access through the mid-level rainforest and offers stunning views over McLean’s Creek. The walkway is ecologically responsible, designed to allow visitors to experience this natural environment without disturbing the precious root systems below. 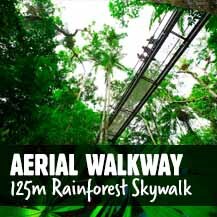 Standing at an impressive 11m high and spanning 125m in length, this wonderful rainforest skywalk provides visitors of all mobilities the opportunity to experience the beauty of the Daintree rainforest, including people in wheelchairs and parents with prams. As you walk along the walkway looking down on the rainforest floor, keep your eye out for native flora, fauna and wildlife including the Daintree icon, the Cassowary. Thousands of visitors each year enjoy viewing these endangered birds from the safety and comfort of this specially designed Aerial Walkway. 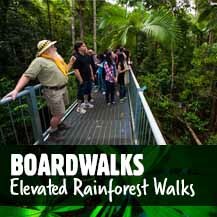 After seeing the rainforest from above on our Aerial Walkway and Canopy Tower, get amongst the foliage down near the rainforest floor by strolling along our rainforest boardwalks. We have four hundred metres of elevated boardwalks, each with separate viewing platforms along the way for your viewing pleasure. Be sure to take your time to stroll across the boardwalks and take a break at our viewing platforms to enjoy the ambience of the beautiful rainforest that surrounds you. The Bush Tucker Trail explores the important cultural practices of the local Kuku Yalanji people and the importance of local Indigenous Bush Tucker. We explore the rainforest plants, animals and fruit that helped ensure the survival of the first Australians who lived here. 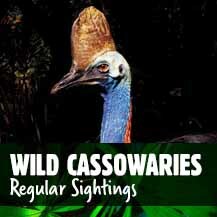 The Cassowary Circuit provides great insight into how Cassowaries have survived here. We view what fruits they eat, understand how they behave and let you know what you can do to protect them. 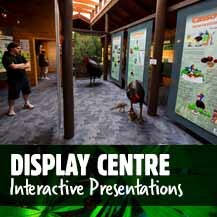 Our award-winning Interpretive Display Centre offers a comprehensive and entertaining look into all of the interesting things that can be found in the Daintree Rainforest. With loads of interactive displays, touchscreen presentations, two digital theatres and panoramic 3D model displays, you can be sure that visitors of all ages can develop a greater understanding about the history and origins of this ancient rainforest. 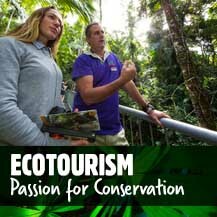 We detail the significant plantlife and ecology of the Daintree Rainforest, and provide in depth information about the unique local wildlife, including the endangered Southern Cassowary and Saltwater Crocodile. Other presentations include rainforest animals, global warming, tropical cyclones, sustainable living and dangerous Australians. If visual and interactive learning is your thing, the Interpretive Display Centre will have you on the edge of your seat and you will be sure to leave with a fantastic understanding and appreciation for this natural landscape. As the first stop after the Daintree River Ferry, our Cafe is the perfect place to take that well deserved coffee break. Overlooking the stunning McLean’s Creek, a natural Cassowary watering hole, visitors can enjoy espresso coffees, iced chocolates and fruit smoothies. We also serve freshly made sandwiches, slices, muffins and cakes. Why not try one of our famous Devonshire Teas – scones with Davidson’s Plum Jam and a pot of locally grown Daintree Tea or enjoy one of our Bush Tucker Tasting Plates. We also have may dietary considerations including gluten free and vegetarian options. 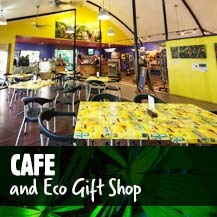 Our Eco Gift Shop is the perfect place to pick up that special unique piece to remind you of your Daintree Rainforest adventure. Find the perfect gift for loved ones with a fantastic range of local and handmade items. Our Eco Shop is fully stocked with arts and crafts, souvenirs, toys, books, clothing and more. With a fantastic range of Bush Tucker foods, jams, and teas we are proud to offer all things grown locally in the Daintree. We also source jewellery and sculptures from local artists and postcards from local photographers. Here at the Daintree Discovery Centre, we are proud to be a leader in the field of ecotourism, specialising in the provision environmental interpretive facilities which help to ensure that visitors understand and appreciate the fragility and sensitivity of the rainforest. Our spectacular Canopy Tower and Micrometeorological Weather Station and Centre are also making an important contribution to Climate Change research. The natural environment at the Daintree Rainforest is important to us. As the Daintree Rainforest is part of a World Heritage area, we pride ourselves on gaining recognition as a premier ecotourism facility. With so many natural wonders on display, and audio Daintree Rainforest tours included for free as part of the entry fee, you can’t pass up the opportunity to come along and visit this beautiful natural landscape for yourself. From our Canopy Tower to our Areal Walkway and Discovery Centre, there is so much to explore and discover that is guaranteed to satisfy the whole family. We hope that when you visit the Daintree Discovery Centre, you will walk away with a whole new appreciation for this world heritage listed rainforest. Check out our visitor info page to find out where you can find us and start planning your visit today. 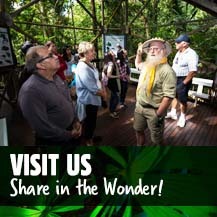 We look forward to welcoming you on your visit to the Daintree Discovery Centre.